A renowned folk cure for an array of health ailments, elderberry is essentially the fruit of elderflower, a flowering plant, also known as Sambucus. Native to the Northern hemisphere, these black/blue berries are regarded as some of the most delicious and tempting fruits on planet Earth. Their mildly sweet flavor and succulent texture makes them highly preferred for syrups, jams, jellies, desserts, as well as a huge selection of cocktails and beverages. While the visual beauty of this pretty, purple fruit is just irresistible, it's more than just a pretty face. Loaded with countless nutrients, it offers a tantalizing combo of beauty, taste and health benefits. It’s one of the main ingredients in Dr Sebi’s ‘Banju’ compound offered at Dr Sebi’s Cell Food. Crammed with flavonoids, anthocyanins, minerals and a host of powerful antioxidants, elderberry has been largely touted as the new immunity-boosting fruit. Thanks to its antibacterial properties, it is considered as a great natural remedy for lowering the risks of viral and bacterial infections, including cold, cough, flu, and tonsillitis. Furthermore, elderberries are also known to strengthen the ability of the immune system to distinguish between self and non-self cells effectively, thereby keeping autoimmune diseases at bay. Elderberries have profound importance in skin health, and consequently, have made their way into tons of cosmetic applications. This is primarily because these berries are enriched with bioflavonoids and vitamin sulfur. Thanks to the potent antioxidant activity of these two components, elderberries are effective in delaying the onset of wrinkles and helping frown lines and age spots to fade fast, thereby improving the glow and complexion of the largest and most conspicuous organ of your body, i.e. the skin! 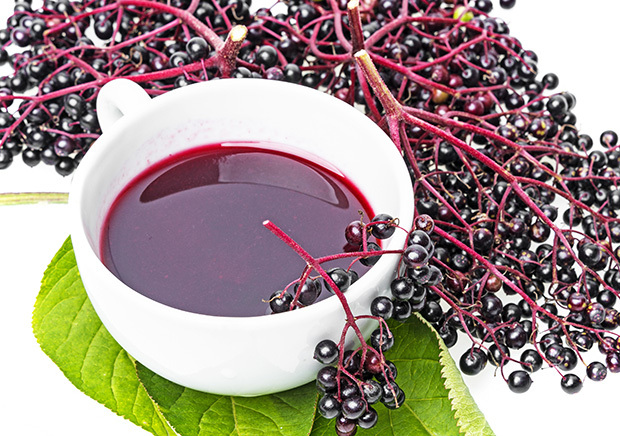 Extract of elderberry contains significant levels of cynidine glucoside, a substance that has proven abilities in reducing the level of harmful, LDL cholesterol in the blood. High levels of LDL cholesterol trigger the formation of plaques in the blood vessels, thereby obstructing blood flow and setting the stage for high blood pressure and subsequent heart ailments. By lowering the level of bad cholesterol in the blood, elderberry promotes cardiovascular health and keeps your blood pressure in check. Even some modern Drs have recommend the incorporation of elderberries in routine diet for people who are experiencing cholesterol problems. The presence of minerals as well as dietary fiber makes elderberries perfect as weight loss aids. This is one fruit that keeps you feeling full for a long period of time, and thus reduces untimely sugar cravings, as well as your tendency to binge eat every now and then. Additionally, the metabolism-speeding effects of vitamins, and the overall low-calorie count help you to make sure you consume food while maintaining a healthy body weight in the process. For ages now, carrots have been regarded as the ultimate food for enhancing vision. But carrots are a hybrid food and doesn't complement the human gene structure. Consider substituting them with elderberry. This alkaline, medicinal fruit helps to alleviate and prevent persistent eye conditions to the likes of glaucoma and macular degeneration, thereby ensuring robust and lasting vision. Elderberries, being fortified with anti-inflammatory and antioxidant compounds can help reduce joint ache, soreness and swelling resulting from inflammation in the joints. The high amounts of vital minerals help to enhance the strength of bones, as well as the repair and growth of damaged bones. By increasing bone density, elderberries help you to stall the onset of certain age-related conditions like osteoporosis that affects the joints mainly. Some bioactive antioxidant substances in elderberries mediate a healing action on the pancreas, which ALSO affects vision according to Dr Sebi. Elderberries work to restore normal levels of insulin and glucose in the blood. This invariably provides stability for individuals suffering from diabetes, as well as non-diabetics who wish to avoid developing this debilitating condition in the future. Elderberry syrup makes for an effective cure to clear up a sore throat, or attain relief from common cold, bronchitis, and other upper respiratory tract infections that result from mucus congestion. Like most cough syrups, elderberries contain high levels of bioflavonoids like anthocyanins, that can soothe irritation and inflammation, and thus reduce the swelling of the respiratory tract. Additionally, this fruit also acts as a potent expectorant that can reduce mucus congestion by clearing out phlegm build-up. No wonder, the juice of this fruit is recommended for people suffering from asthma. If you are looking to incorporate a fiber-rich fruit in your diet that can provide relief from your digestive issues, then elderberry is surely your answer. A single serving of this fruit is enough to meet a whopping 30% of your daily fiber needs, as well as enable your digestive system to function properly. Regular intake of elderberries reduces flatulence, eliminates constipation, and also increases the overall health of the gastrointestinal system. With such spectacular health benefits, elderberry sure does qualify as the ultimate super fruit to bank on for improving your health status and attaining rapid weight loss naturally. However, one consideration that involves its consumption is the fact that not all species are really edible, and it's always prudent to purchase elderberries from a reputable store. Lastly, it is also advisable to seek the counsel of your doctor or herbalist before proceeding to consume this fruit on a daily basis, as it is not recommended for people with kidney problems and specific food allergies.